Join us for this fun Creative Grids Technique Class! Make a table runner or a full size quilt. Make a Jelly Roll Rug! Join us anytime from 4:01pm - Midnight! Have you always wanted to learn how to make a quilt? ?Now is your chance! Learn how to do traditional chenille technique! Class project can be a panel or a pillow size! 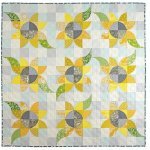 Sunflower Quilt! This is so perfect! "Soak Up The Sun" sunflower quilt! Join us for our AccuQuilt May Demonstration! Hands on training Learn to how to make machine applique look like it was done by hand. 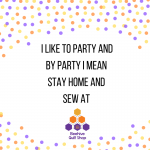 Join us for this fun and whimsical quilt! This is an EASY as super fun quilt! Great for beginners Or Advanced!